Stem: erect, < 2 m, bark smooth, peeling or shredding in age or not, twigs with unicellular hairs, papillae, and/or +- flat glandular scales. Leaf: (1)2--8 cm, 1.5--3 cm wide, leathery, evergreen, margin flat or +- rolled under, abaxially with sparse to dense papillae, +- flat glandular scales, adaxially with scattered +- flat glandular scales and/or papillae. 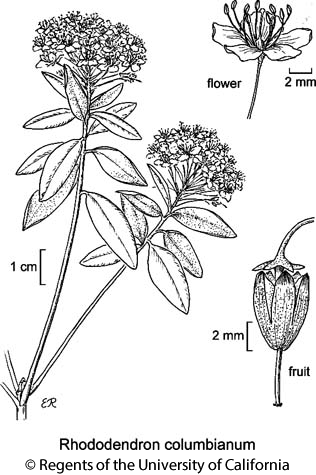 Inflorescence: +- rounded, bracts, bractlets with +- flat glandular scales, margins ciliate. Flower: corolla widely bell-shaped, white to cream; stamens (8)10, +- equal. Fruit: 8--10 mm wide, +- longer, dehiscing base to tip. Seed: +- fusiform, coat +- elongated beyond narrow end. Citation for this treatment: Kathleen A. Kron & Walter S. Judd 2012, Rhododendron columbianum, in Jepson Flora Project (eds.) Jepson eFlora, http://ucjeps.berkeley.edu/eflora/eflora_display.php?tid=91858, accessed on April 23, 2019. NCo, KR, s NCoRO, CaRH, s SNF, SNH, CCo, SnFrB, n SCoRI, Wrn, SNE; Markers link to CCH specimen records. Yellow markers indicate records that may provide evidence for eFlora range revision or may have georeferencing or identification issues. Purple markers indicate specimens collected from a garden, greenhouse, or other non-wild location.